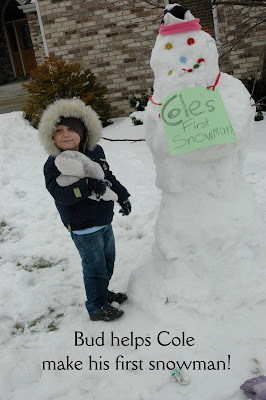 My children cannot imagine never having seen snow... but Cole (the son of my very best friend Shannon) had never seen it. So, they flew in this weekend to come to Kaya's party and for Cole to see snow. He loved it (well, he did not love the sledding, but that is a another story...). My girls loved seeing him see snow for the first time, and they helped him build a snowman. How I wished we lived where we never had to see snow.... I was so grateful they were here and I am so sad now that they are gone. It stinks living across the country from your best friend.